Sickness has hit my house. As I type this my daughter is resting after a horrendous morning that involved vomiting every 7 minutes. Ughh! I am hoping the shower, rest,and and a tad of ginger ale will soothe her a little. I am trying to pump fluids back into her. This bug seems to be hitting hard in our area. I feel so bad for her. I picked her up and she was covered with sickness. In high school, throwing up in front of classmates is so humiliating. She was in a rush to get out of the building before she saw more people. But somethings must go on. Wednesday's mean a new challenge at Crafty Creations. I made this card earlier this week for the latest challenge which is 3 little words by Shelly. Ironic how it fits for today's events. 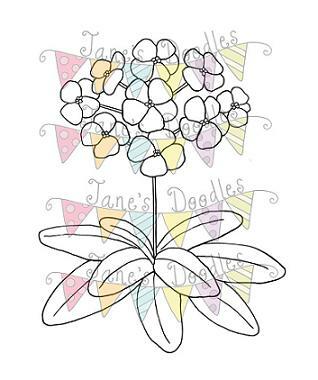 The image is from Jane's Doodles. It is the polyanthus flower. I printed it on Stampin Up cardstock and colored in with markers using my blending pen. I added a touch of glitter to the floral centers. It's gorgeous!!! The doilies are perfection! This is lovely - I love the image, and the pretty colours too. You don't have to use a lot of embellishments with a flower as gorgeous as this one. Just a (stunning) doily and a perfect bow. And there you have it; a beauty! I am so sorry to hear that your daughter is ill. I hope she will be feeling better soon. Sorry to hear your DD is not feeling well. This is a gorgeous card! This is so pretty Amy! Love the purple bow and the doily! Sorry to hear your daughter is ill. Hope she is better soon. I love your card Amy. The beautiful image and the lovely colors and ribbon is perfect with it. I love that little doily poking out the side, thank you for joining us at Craft your Passion. Great card!Love the doily behind the image! Thank you for joining Karen`s Doodles this week! :) Good luck! ewww, yuck....so sorry to hear the sickies have hit at your house. I hope your poor DD feels better soon, and hope the rest of you don't catch it next. Your card is just adorable! I love that unique flower image, and your coloring is lovely. Love the addition of the glitter in their centers. Love the softness of the doily mixed with the hard lines of the graph paper, and love that pretty ribbon, too. Lovely colours. Thank you for sharing with us at Karen's Doodles this week. So sorry for the sickies! Hope everyone is on the mend soon! Your card is pure loveliness! 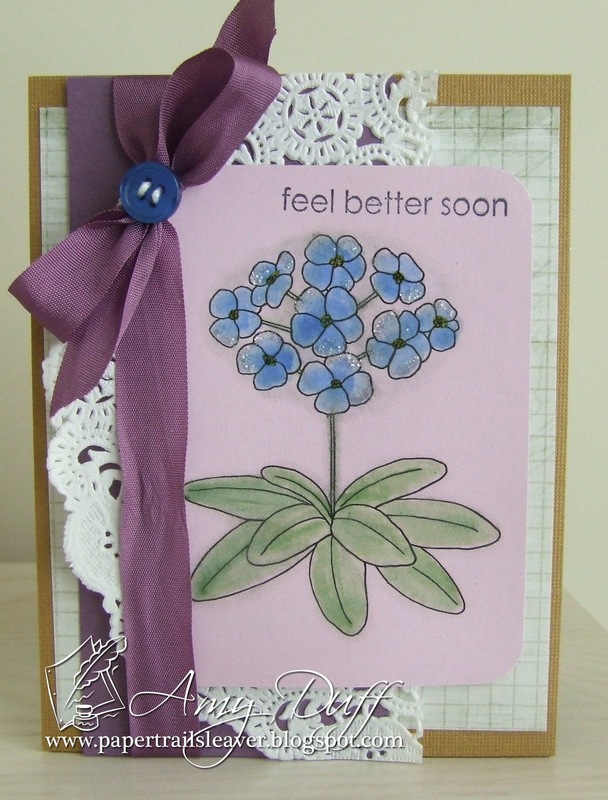 Sending get well wishes to your baby Amy :) your card is very pretty! Amy, this is wonderful! Love how you used the doily and your coloring is fabulous! Beautiful card! It's so pretty. I love your purple ribbon. OMG... I hope your daughter is feeling better now, sending you both big hugs!! What a gorgeous card, I love everything about it!! Gorgeous card - I love the doily and ribbon - totally perfect! oh Amy, I hope your daughter is much better by today! awww, sending hugs & prayers your way! Gorgeous card, love the doily in the background!!! hugs & blessings to you & your precious family! Beautiful flower card. Love the layout. Fantastic coloring. Love your card ! Thanks for playing along with C&T ! Very pretty. Thanks so much for joining us at Ooh La La.